What Does Code P0031 Mean? OBD II fault code P0031 is defined as “HO2S (Heated Oxygen Sensor) Heater Control Circuit Low (Bank 1 Sensor 1)”, with “Bank 1” referring to the bank of cylinders that contains cylinder #1 on engines with two cylinder heads, and “Sensor 1” referring to the oxygen sensor located before the catalytic converter(s), i.e., upstream of the converter(s). OBD II code P0031 is most commonly set when the PCM (Powertrain Control Module) detects a signal voltage or a resistance level from the oxygen sensor control circuit that does not fall within predefined parameters. On most applications, the sensor heater circuit voltage should closely match the battery voltage, and a deviation from battery voltage of around 10% will lead to the PCM generating and storing a fault code, and illuminating the CHECK ENGINE light. On most applications, the electrical resistance in the circuit would typically be around 8 Ohms, and a deviation of around 10% from this value will result in a code being stored. A code can be stored when the PCM does not detect a change in the oxygen sensor reading for periods of more than 8 continuous seconds. NOTE: The time required for static (constant) readings to cause a code to be stored may differ between applications, so refer to the repair manual for exact values. In order for any engine to work at peak efficiency, it requires an air to fuel ratio that allows all of the fuel in the mixture to be combusted without any excess air remaining after the combustion process is complete, or with additional air required to complete the combustion process. This ratio is known as the “stoichiometric” mixture/ratio, and it refers to a fuel to air ratio required by an engine under an unvarying load. There is no ideal fuel to air ratio that applies to all engines under all conditions, and many factors, such as driving style and driving conditions can temporarily swing the ideal mixture for a particular engine towards either a lean, or rich condition. However, the PCM on any particular application collects data from various sensors (including the oxygen sensor(s)), to calculate and deliver the ideal air/fuel mixture to suit the reigning operating conditions. The role of the upstream oxygen sensor(s) in this is to measure the amount of oxygen in the exhaust stream, which value is used by the PCM to make adjustments to ignition timing, VVT/VCS systems (where fitted), and injector pulse widths to maintain an optimum fuel delivery strategy, thus keeping the engine performing at peak efficiency. NOTE #1: Most modern oxygen sensors are heated electrically, which makes them responsive much sooner than if they were heated only by the exhaust stream, thus reducing emissions, as well as the time required for the PCM to enter a closed-loop mode. NOTE #2: Some applications, such as some Toyota and other Japanese-made vehicles, use AIR/FUEL SENSORS instead of conventional heated oxygen sensors. Refer to the relevant manual for code setting parameters and testing procedures for these applications, since the two types of sensors are NOT interchangeable. 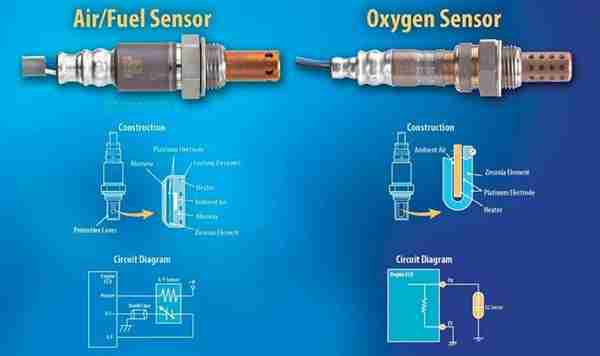 The image below shows some of the differences between a typical heated oxygen sensor, and a typical air/fuel sensor. Note: Circuit Low Input codes are often the result of low battery voltages (that can have many possible causes), bad connections across electrical connectors or previously repaired wiring, as well as corrosion in electrical connectors. Other possible causes of low input voltages include poor installation of aftermarket components, poor quality aftermarket components like fuses, relays, and switches, and modification of the electrical system that could include the use of conductors that are not rated for use in a particular application. However, poor connections often result in high resistances in some parts of the circuit, which is why it is important to perform resistance and continuity checks during the diagnostic procedure. What are the common causes of code P0031 ? Although PCM failure is not altogether impossible, it is an exceedingly rare event, and the fault must be sought elsewhere before any control module is replaced. NOTE: Modified engines could cause all manner of oxygen sensor and emission related issues, simply by virtue of the fact that they do not create exhaust streams that a stock oxygen sensor and control circuit can be expected to analyse reliably. Getting the emission control system on a modified engine right is largely a matter of trial and error, and the diagnostic/repair procedure outlined here should therefore not be applied to non-stock engines and exhaust systems. What are the symptoms of code P0031 ? NOTE: Not all of these symptoms may be present in all cases, and the severity of one or more symptoms could vary between vehicles. How do you troubleshoot code P0031 ? NOTE #1: Since each oxygen sensor has its own dedicated heater control circuit, you will need to have a repair manual for the application being worked on in order to be able to correctly determine the location, function, color-coding, and routing of all wiring associated with the oxygen sensor being investigated. NOTE #2: Diagnosing code P0031 requires that the engine be in good running order, with no unmetered air entering the engine. If other codes relating lean running, or misfiring conditions are present long with code P0031, repair these issues first before attempting an electrical diagnosis of this code. NOTE #3: It is important to retest the system after each step in the repair procedure to ensure a reliable repair. Record all fault codes and freeze frame data present for future reference. 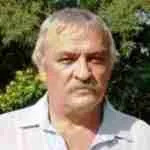 This information can be valuable in identifying intermittent faults. Since burnt wiring is a common cause of code P0031, thoroughly inspect all associated wiring and connectors for signs of damage, short circuiting, or corrosion. Pay particular attention to the routing of wiring, since unsecured wiring can burn against hot exhaust components. Repair all wiring issues as required. If the code persists, perform resistance, continuity, ground, and reference voltage checks on the wiring in the circuit, but be sure to consult the manual to identify the wiring associated with the sensor in question. Compare obtained readings against values stated in the manual. Reference voltages should always closely match battery voltage; about 12.6-, to 13.8 volts. Be sure to disconnect all control modules before performing continuity checks to prevent damaging a control module. The oxygen sensor itself forms part of the control circuit, and must therefore be checked as well, but be sure to disconnect the sensor from its wiring before performing resistance and continuity checks on the sensor. Compare resistance readings to values stated in the manual, and replace all sensors that do not comply with the manufacturer’s specification. NOTE: On some applications, the reference voltage and ground is supplied by the PCM. In these designs, there is no fuse incorporated into the circuit. Consult the manual on which design is used on the vehicle being worked on. If the fault persists and scanner can monitor live data streams, start the engine and monitor the live data. Typically, the signal voltage from pre-catalytic converter oxygen sensors should constantly vary from around 0.1V, to about 0.9V once the engine has reached working temperature and the PCM has entered into closed loop mode. If obtained readings do not fall within this broad range, or if there are long periods (typically 8 seconds and more) during which the readings remain constant, remove the oxygen sensor(s) and inspect it/them for signs of discoloration, or the presence of undesirable deposits. Both conditions can cause code P0031, meaning that the cause/origin of the discoloration or deposits must be found and corrected. 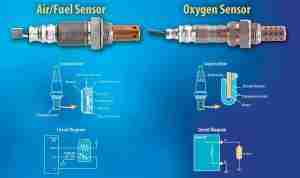 However, oxygen sensors that are damaged by additives cannot be repaired, and replacement is the only reliable remedy. NOTE: At this point it is important to determine if the vehicle had been running with any type of additive in either the fuel or the engine oil, or both. Some aftermarket oil and fuel additives contain silicone-based substances that can permanently damage oxygen sensors. If it is suspected that oil or fuel additives are the cause of discoloration or deposits, check the condition of the spark plugs, since the plugs will often also be discolored or covered in harmful deposits due to long term exposure to some, mostly poor quality additives. If sensors are replaced, reconnect (and secure) all wiring, and operate the vehicle to see if the code returns. It is a good idea to leave the scanner connected during this drive cycle so that live data from the sensor control circuit can be monitored effectively. If all electrical values correspond to the values stated in the manual, and new oxygen sensors had been fitted, it is unlikely that the fault code will return. However, if it does return, there is likely to be an intermittent fault present. Intermittent faults can sometimes be extremely difficult to find and repair, meaning that the fault may have to be allowed to worsen before an accurate diagnosis and repair can be made.